Live streaming is a fairly new money-making niche for online creators. It allows internet celebrities to connect with their fan-base and give real time updates on what they’re doing and what is going on in their lives. Some creators use this only occasionally as a sort of “special event” for their subscribers, but some people from Twitch (nicknamed “life-streamers”) have decided to go above and beyond that simple concept, and have become full-time “live-streamers.” They stream for dozens of hours a week and occasionally even have tens of thousands of concurrent viewers. 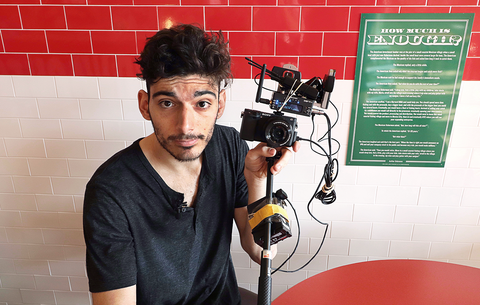 One of the first “full-time live-streamers” was Paul Denino (An online personality who goes by the alias “Ice Poseidon”). Denino began his first stream playing Runescapein 2015, and built an enormous following of hundreds of thousands of active subscribers. He was just a “shabby dude” who shared his life online, taking the camera wherever he goes. His fame on Twitch, however, would prove to be short-lived. For months, they allowed Denino to do as he liked, but it was inevitable that Twitch would soon have to act and set new rules for live streamers. The breaking point was much more massive than anyone would have imagined, and involved a bomb threat at an airport. Denino was doing his usual routine of streaming his life – though this time, at an airport – and accidentally showed all of his flight information. Soon after, as he was boarding the plane, a group of police officers pulled him out and made national news through a process known as “swatting” (as can be seen and explained in LiveStreamFails’ channel here). In swatting, people anonymously call police around a live-streamer’s current location and give false claims of criminal activity involving the streamer. This finally prompted Twitch to completely alter their rules and instantly ban Paul Denino from their platform. This became a lesson to both Denino and the Twitch platform, forcing radical change on both sides. Twitch has cracked down on situations like these, and did not allow Denino to return to their platform. YouTube, however, welcomed Denino with open arms and has allowed him to stay there to this day. He still streams several times a week, sometimes even the entire week, and has certainly learned his lesson. This issue extends much further than the story of a simple single live-streamer, and exemplifies the problems that still lie in live-streaming. As a relatively new concept, we can only wait and see to find out what other precautions platforms like Twitch and YouTube will have for their “life-streaming” creators. If you are interested in watching one of Denino’s daily adventures in real-time, you can find his channel here.